PRODUCT DESCRIPTION: Biological formulation which breaks down the slime and other organic buildup that will accumulate on drain pipes. It will not hurt the pipe regardless of the material the pipe is made from. Takes away the breeding ground insects will use including drain or moth flies, fungus flies, phorid flies but also springtails, ants, psocids, book lice, roaches and more. RATE OF APPLICATION: 4-8 ounces per drain per week until the problem subsides. Treat late at night, just before retiring, and allow the treatment to sit in the drain as long as possible before running the water again. If insects are appearing during the week, use PT-CYKICK down the drain daily as needed. It will kill active pests and help break the cycle that much faster. Is this safe to use in septic tanks because I have the springtails coming up in the master bathtub and I have a septic tank. Absolutely yes. In fact Survivors will generally help most any septic system by helping to clean out organic waste buildup which can cause the system to stall, clog and back up. Also, remember the PT-221 should be used at the same time as the Survivors for the best long term control of springtails. I didn't get an answer via e-mail for some odd reason. 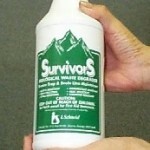 I might be interested in this Survivors item, but what are the active ingredient(s)? The most we know about the active ingredients can be found listed on the supporting literature links above (label and msds). Let us know if you need more assistance. Do I use the survivors before the pt-cykick or after? Thanks. Ideally use them on different nights. This way they each can have a good night to do their job. So first, say on a Friday night, you should apply 2-4 oz of Survivors down affected drains. Do this just before retiring and after the sink is done being used for the night. This will allow the treatment to settle down and work for several hours before the sink is used again. Next, on Saturday or Sunday evening, spray the PT-Cykick for 3-5 seconds down the same drain. Again, this should be done late at night, just prior to retiring for the evening, so the treatment can have several hours to work before the sink is used again. Hello – We have Survivors and many of your products. Is Survivors safe to use in an older basement floor drain? We are battling these suckers and I think this is their last place of moisture in the house. There is a large stone on top of the drain holding the dehumidifier and water softener hoses in it. They seem to be on this stone. I just found 15 or so of them. Thanks in advance! Yes, Survivors will be fine to use down this drain. In fact it has chemical or corrosive qualities so it won't hurt or react with metal, plastic, etc. Be sure to supplement the application with PT-CyKick down the drain too. They'll give you quick control of any adults you see with the Survivors providing the long term control by taking away their food and nest site. I thought the bugs we have were fruit flies but after reading the article I got this link from I now believe they are springtails. The question I have though is what products do I need to treat our garbage disposal? My guess is from reading the article is that they're living in the sludge that builds up inside it, but now I also noticed them coming up out of our bathroom sink. The building we live in was built in 1953. Go with the Survivors above. It will definitely help by removing the sludge and slime buildup where insects like springtails can live. We also recommend spraying down the drain with the Cykick aerosol as explained in our article too. The good news about using these two products will control whatever is down the drain lines. I have springtails in the master bathtub. I want to use the items suggested but am worried about harming my cats. Is it safe if they were to be around it? When used down the drain, the Survivors above and the PT-Cykick aerosol will pose no hazard to you or your pets. I have phorid flies in my house. I do not know where they're coming from. I recently got new Plumbing so I don't believe I have a leaking pipe. I have never seen them come out of any of my drains.. I do have a septic which I had emptied in May of 2016. The home is a mobile home put on the property in 1994. I just moved there in May. So I do not know if this problem was already there before I moved in. I do recall seeing maybe one or two random bugs but I thought they were nuts and it was at the opposite end of the house which they are not at the opposite end of the house anymore. I have looked everywhere inside my house for these bugs. They appear but I cannot find out where they are breeding period. Please help as I am desperate. I have noticed them in 1 bathroom for the most part and also flying around my kitchen and dining room area. But I also see random flies in a few other rooms. But not as many as I have seen in one bathroom and it seems my kitchen. I am so frustrated and I do not know how to get rid of these. If you read our Phorid control article, you'll see that yes, Survivors can help for drain line issues. But based on your account of the problem, I suggest going with the Aerosol Machines. If you set these up throughout the home, it will effectively kill all flying pests and this will eventually break the life cycle. Generally this takes at least 2 weeks but for problems like yours that are distributed throughout the entire home, this is the best way to proceed. Great Effective Product! 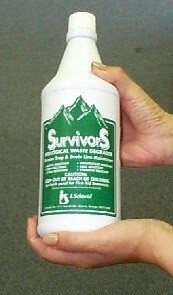 I have been a commercial drain product user for years and recently discovered Survivors drain treatment. It is great to treat sinks and toilets in spare rooms that you might not use frequently. We had mites coming up through our pipes and this fixed the issue after about 3-5 days and doing two overnight treatments like the instructions say. I am a fan and will continue to buy this product instead of the overpriced Drano chemicals I have been using in the past. I'll see one springtail in my kitchen sink occasionally but there's a window above it. Same with my bathroom tub. I'll see one or two but there's also a window next to my tub and also occasionally one in the bathroom sink. I'm thinking they are coming from window but not sure if they were coming from drain wouldn't I see a lot more ?? Your observations point out what our article on springtails explains. Basically springtails will try to exist everywhere. And as they move about migrating onto and into structures, most die. But some will live and be visible. In homes where 1-2 are seen, most people never notice so they don't even know (or care) about their presence. But seeing 1-2 means there is a chance the problem will get worse so if you want to avoid the issues most of our customer have, treating down the drain with Survivors and Cy-Kick aerosol would be the smart way to proceed. As you'll read in the article above, treating the drain with Survivors (seen above) will provide long term protection but the Cy-Kick should also be used to kill off any active ones you see now. Drain flies are GONE! This is the BEST drain product I have ever used! Seriously, Not only did it almost instantly unclog a couple of slow drains in my house, but it ERADICATED the drain flies that were steadily infesting my shower. This product is a MIRACLE! Great customer service! The products seem to be working but I have yet to see if it will really take care of the crickets in the drain. So far so good. However, why I chose to write a review was the lovely customer service agent who helped me. I apparently used the PT-Cykick can incorrectly. In order to point the straw down the drain I had to at least tilt it on the side thus emptying the propellant – so I have a half a can left without being able to spray any of it out. She kindly directed me to a link with a video showing how to reposition the straw. She really took time to research it and sent this in a second communication. Great customer service. The product works, just having to keep using it right now, so not sure how permanent it is or whether I just have a huge problem. But I am optimistic! Which products would work best for crickets coming up through my tub drain? How often should they be applied? Also, should I treat the line coming to my washer and will I need to treat the bathroom drains on the 2nd floor as well? I am on a lagoon and home is built with a small crawl space foundation. Should I expect this to be a continual problem? In the post, you'll learn you need to pour 2-4 oz of Survivors down the drain once a week for one month and then at least twice a week, treat with Cykick aerosol. The aerosol will kill the ones nesting in the drain and the Survivors will take away the food they're using which tends to build up in drain lines. As for other sinks in the home; it would be wise to treat them all at least once even if they haven't shown activity. This will ensure the problem doesn't spread. Lastly, we have found that our customers who get this problem have a tendency to see it resurface 1-2 a year if they stop treating it after a month. It helps keep the springtails population down, been using it regularly for a few years now. Needed to put it in a slow drain 3 nights in a row but seemed to clear it and now I try to do monthly.